Arguably the simplest dressing for any salad, red wine vinaigrette—simply meaning “a little vinegar” in French—splashed over vegetables and greens enhances food without adding an overbearing taste of its own. There is no single recipe for concocting red wine vinaigrette—your taste buds will tell you when you’ve reached the right balance of savory and acidic. Temper the dressing’s bite by increasing the proportion of oil to vinegar, or infuse the oil and vinegar base with fresh or dried herbs for subtle layers of flavor. 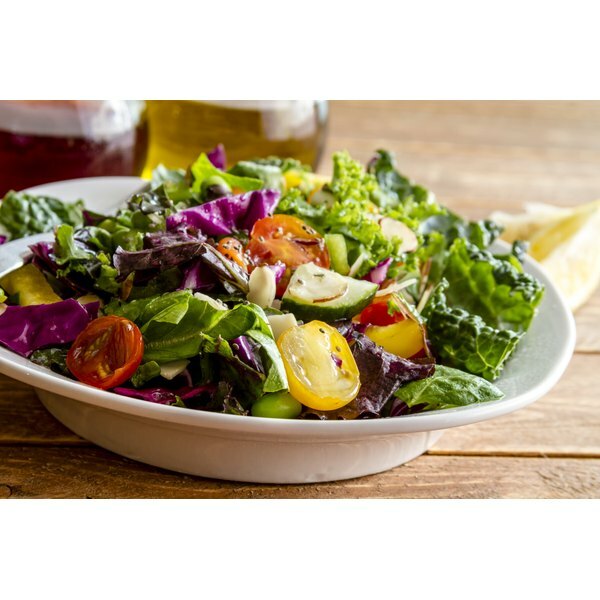 The best part: homemade red wine vinaigrette is usually lower in calories than store-bought dressings, and has no saturated fat or artificial ingredients. Pour approximately 3/4 cup extra virgin olive oil directly into the glass jar. Follow with 1/4 cup of red wine vinegar. Increase the oil and vinegar in the same proportions if you wish to double or triple the recipe. Add a big pinch of salt, and a smaller pinch of freshly ground black pepper, to the oil and vinegar mixture. Peel a clove of fresh garlic, then lay it on your work surface. Crush the clove slightly by pressing the flat side of the chef’s knife against it. Add the crushed garlic to the jar. Sprinkle your choice of fresh or dried herbs into the mix. Screw the lid onto the glass tightly and shake vigorously to thoroughly mix all of the ingredients together. The blended vinaigrette should look slightly opaque. Unscrew the lid and give the dressing a taste test. If it seems bland, add another splash of vinegar and a dash of salt. If it tastes too strong and acidic, add another dollop of olive oil. Shake the jar again to blend. Pour the dressing over washed and dried salad greens and toss with salad tongs. Serve right away. Traditional French vinaigrettes employ tarragon, parsley or herbes de Provence along with a plop of Dijon mustard and minced shallots. For an Italian twist, try oregano, thyme or basil. Red wine vinaigrette won't cling to wet salad greens. To get the dressing to bond to the veggies, wash and dry them completely in a salad spinner before tossing with the dressing.